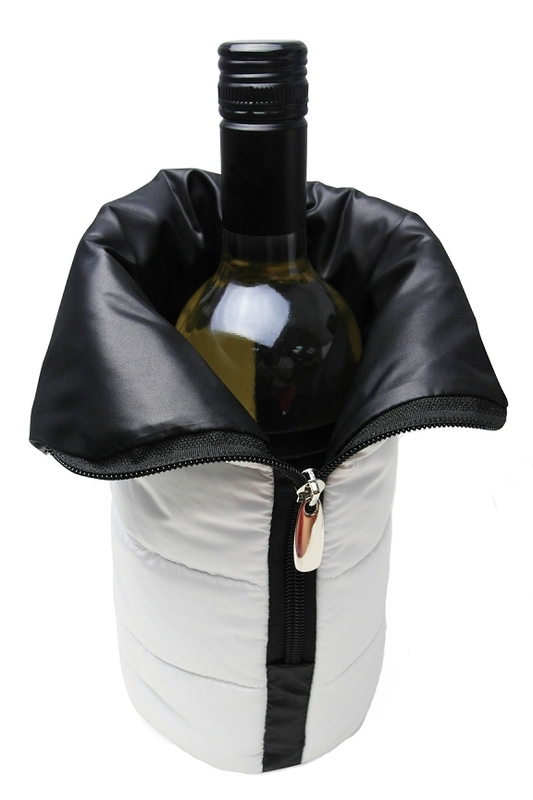 Wrap wine bottles in this stylish, insulated bag, and keep the contents cold with the freezable internal sleeve. The outside looks similar to a puffy winter coat, and the removable sleeve inside is a lot like other freezer packs, but with added elastic to hold it in place. The two combined will keep your alcoholic beverage deliciously drinkable, and at the temperature you prefer. Just toss the pouch into your freezer for two hours, slip it around your bottle of wine, then zipper them both securely inside the thick cover. Your beverage will maintain it's temperature for three hours or more, so it will be enjoyable right down to the last drop. Thanks to the integrated handle on the side, you'll be able to pour it without any warming because you won't have to take it out, or touch the glass with your hand. It's perfect for dessert and white wine, but you can use it for anything else that fits. The durable material is totally washable and reusable, and it comes in your choice of two color combinations. Don't choke down another glass of warm liquid. Get this bag to ensure that every glass is served at the optimal temperature. Prefer something a little bit different? We also carry a Freezable Pouch that's similar. It slides right onto your bottle, and it doesn't have an additional bag, but it's larger, so it doesn't need one. You still get the side handle for convenience when pouring, and it comes in two colors with fun graphics on the front. Looking for something to transport bottle when on the go? Check out our 2 Bottle Tote or Four Bottle Tote. They are insulated to maintain temps and protect against damage, and internal dividers allow you to carry more than one bottle without any clanging glass. Frozen Sleeve. More than just insulated, this cooler bag provides long lasting results thanks to the removable freezer pouch on the inside. Thick Insulation. Your bottle will look like it's ready for a snowball fight, but that wintry covering will also help to maintain temps fro an extended period of time. Easy-to-Use. So simple, and so effective. It's as easy as sliding on the sleeve, and zipping up the zipper. Once securely inside, your bottle will be easy to serve thanks to the handle on the side. Long Lasting. 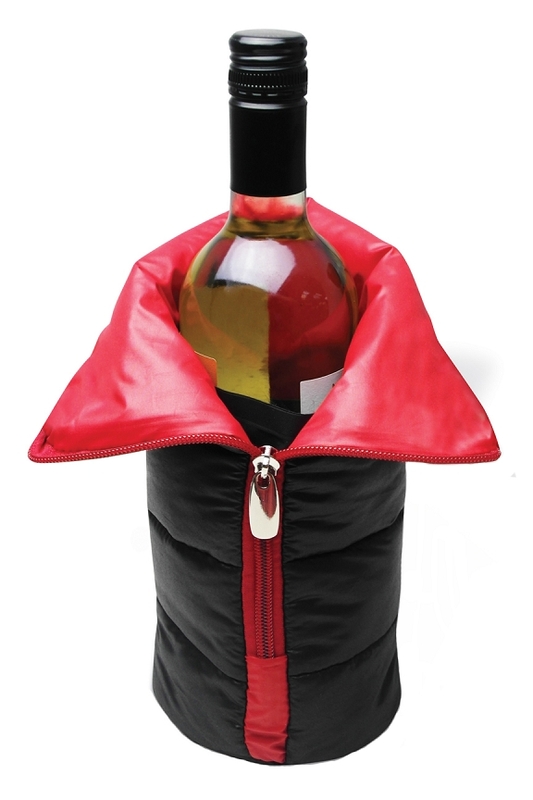 Once in place, it will maintain the temperature inside the bottle to keep your wine cold for an hour or more. Reusable. The durable bag is totally washable, and it will last for way longer than cheap, plastic alternatives. When dirty, just wipe clean to use over and over again. Versatile. 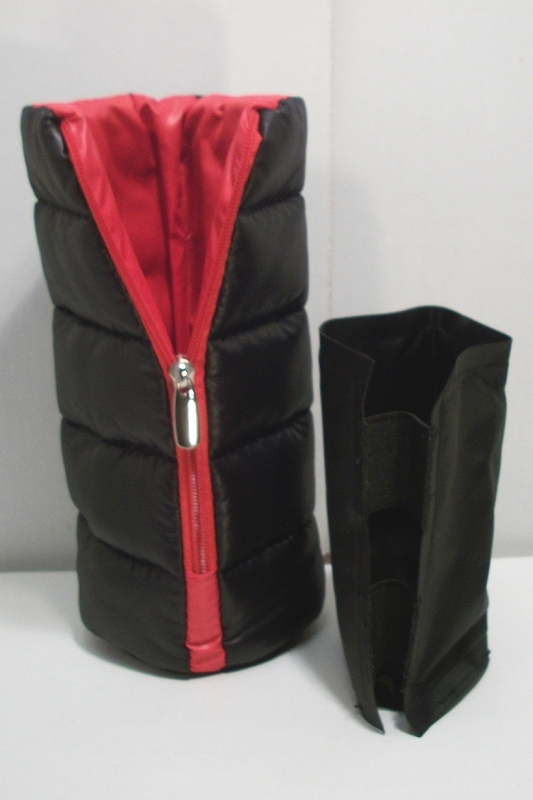 The large bag and elastic inner pouch are able to expand to accommodate many bottle sizes. Use with 750 ml or 1.5 L wine bottles. Uses Keep wine cold until the last drop has been poured. An inner frozen layer chills the bottle, and the outer insulation traps the cold inside. Preserve beverage temperature, and use the handle on the side to serve without touching the bottle. Integrated Handle Yes - 1 reinforced serving handle. Compatibility Intended for use with standard size, 750ml bottles, or larger, 1.5 L bottles. Cooling Ability Keep wine cold for three hours or more. A convenient way to store and serve wine. Protect the bottle, maintain temperature, and make it easier to pour. Perfect for white and dessert wines. Order Yours Today!